With the 2015 edition of the AJ Bell London Triathlon just days away, make sure you are prepared for your best event experience by reviewing our newly updated "How to Succeed" feature on the race. Even if you have raced before, this years race does include some significant course changes so make sure you are informed before race day! 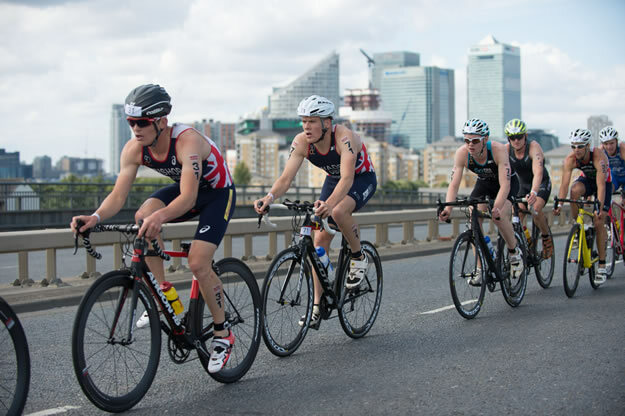 The AJ Bell London Triathlon takes place at the ExCeL Exhibition Centre in London's Docklands and is the largest triathlon in the world with over 13,000 competitors expected to participate in one or other of the varied events over a two-day period. While the fact that it's the biggest means that there going to be an awful lot of people there, it doesn't mean that everyone goes at the same time! There are 16 wave starts on the Saturday and 20 on the Sunday plus there's a choice of distances from Super Sprint through to Standard distance (and introduced from 2010, 'Olympic Plus', which features an 80km bike leg), together with dedicated corporate waves. At least a third of the competitors will be first-timers, a staggering statistic in itself. In fact, this whole event is all about mass-participation and it has grown steadily year-on-year with a major focus being on fund-raising for charity, the official 'Gold' charity is Macmillan Cancer Support, alongside a host other associated charities. For the more experienced athlete there is the option of the 'Sub 2:30' wave, plus of course the Elite's racing in the final British Triathlon Super Series event of the year. So, why are we doing a 'How to succeed...' feature? Well, because there are other little tips and tricks that can help you through London that are more than just a line or two in the race instructions! The swim at London takes place in a dock so there's no current to deal with but, because the water is contained in a tank, there can be a fair amount of chop once the event gets going. It's a deep water start and you need to be at the marshalling point at least 20 minutes before your wave. Because of the sheer size of the ExCeL building it could take you ten minutes to get there and there are always people who leave it too late. Remember, you collect your swim cap at the marshalling point, don't go worrying that you left it behind or someone forgot to put it in your race pack, and then enter the water to swim across to the start line. The swim course itself is an 'out and back'. You swim down the dock to the appropriate buoy and then make a 180 ° turn to the right to swim back towards the start, before turning right to swim in to the exit ramp. The exit ramp is part submerged so you can swim right onto it before finding your feet. NOTE: The swim direction changed from the 2010 event and that remains for 2015! The first leg of the swim will be next to the ExCeL building, meaning you will swim in a clockwise direction. This should enhance the experience for spectators, who will be able to closely watch the 'out' portion of the swim. All events will be one lap, except for the Olympic Distance events on Saturday who will complete two circuits of the 750m Sprint course. Do familiarise yourself with the swim course prior to the day, via the excellent course maps within that race pack! This will greatly enhance your understanding of what lies ahead, and improve your confidence and performance on race day. If you are an inexperienced open water swimmer then do try to remember to kick your legs a bit before you get to the ramp to get the blood circulating again so you don't get that dizzy feeling when you stand up. Another unusual feature of London is that you have to take your wetsuit off straight away and stuff it into a plastic bag (outside) that you then carry to transition (which is inside). Why? Well, imagine just how slippery all that flooring would get after a few thousand athletes had dripped a litre or so of water over it! And the first bit of floor you get to go across is a set of stairs...please, do take care. Oh, and be aware - wearing a wetsuit is compulsory! It's a long way to pretty much anywhere in transition and because the access points are in the corners of transition to ensure that the distances are equal for all athletes you will run in off the swim in the top left corner of a wide rectangular area. Bikes are racked in marked rows by wave and it really is essential to have taken the time to walk round the area and establish where you are relative to the entry and exit points. Marking your transition spot is not allowed but there are legal ways to assist you - a brightly coloured or distinctive pattern on your transition towel could mean the difference between finding your bike after the swim and running around wasting valuable minutes. Balloons, flags and talc on the floor are definitely not allowed! All of the entry / exit points will have signs indicating where you "bike out", "bike in", "run out" etc - do take the time before your race to locate these, and mentally rehearse the routes / directions which you will be following. Once the guns goes, it is easy to forget, so it is well worth having this knowledge long before you arrive there mid-race and the adrenaline is flowing. If you've ever seen the transition at Windsor and thought that was big then be prepared for a major upgrade - we are talking double and then some! Announced in earlier in the year, the bike couse for Sunday's races has changed for 2015 and now includes Canary Wharf. Also note that the bike loops are different for both the Saturday and Sunday events! On Saturday, the bike course for each event consists of a 10km loop. The course sees you head briefly west once exiting the ExCeL, before a 180degree turn at the Leamouth roudabout. You then head back towards - and past - ExCeL, towards Beckton until the turn point by the University of East London. You then return towards ExCeL. At the completion of your required number of bike laps (one for the Super Sprint, two for the Sprint or four for the Olympic), make a left turn back up the 'ramp' into the ExCeL centre an into transition for the run. Note, you ONLY go back into ExCeL at the completion of the bike - not at the end of every lap! The new Sunday course comprises of a 20km circuit which will be completed four times for those racing the 'Olympic Plus', twice for the Olympic Distance and once for the Junior Elites (the only wave racing over the Sprint distance on Sunday). 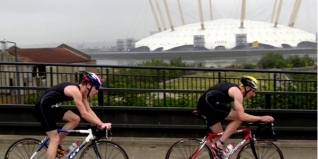 Like the Saturday events, the bike course heads west towards central London and Billingsgate Market you'll make a left hand turn for an out-and-back section through Canary Wharf, before continuing on to your turn point which is just before the Rotherhithe Tunnel. You'll then head straight back towards (and past) ExCeL towards Beckton, with the final section of course mirroring that of Saturday. The bike in actually moves from the morning to the afternoon races but it is always located at the bottom left corner of the currently active transiton section. The flow lines are clearly set out and you'll need to navigate back to your bike. Again, we cannot stress too strongly that it is so worth taking the time to figure things out in advance because it is easily possible to waste minutes of time running up and down the wrong row looking for your slot. Once changed you will head for the run exit which is in the top right corner of the transition. Notice that the flow lines work the diagonals - there is always the possibility of having someone going on the opposite diagonal so do keep your eyes open and be aware that others are racing and have just as much 'right of way' as you do. Listen to the marshals and stay alert. From 2010 - and applies this year too - the run courses for all events take place on a new run course loop, based on the eastern end of the venue. This greatly enhances spectator access to, and support on the run section. On exiting transition from the bike - you will of course have noted this route before you started, won't you?! - you head out of Excel, and then along the dockside towards Royal Albert Dock, and the turn point. For Saturday's races the run course is an approx. 2.5km loop, which means you complete one lap (Super Sprint), two laps (Sprint) or four laps (Olympic) - each lap returns into the ExCeL venue, meaning a tough incline to get back 'up' from ground level. For Sunday's races (Olympic and Olympic Plus), you will now complete THREE LAPS of approx 3.3km, rather than the four laps of 2.5km. Make sure you do the correct distance and the correct number of laps!!! Oh, and one thing on timing chips - please wear it, at all times, on your left ankle! Do not wear it on your wrist. Do not wrap it around your bike, or put it in your pocket. Yes, every year people do this - and plenty of more bizarre options - and then wonder why their results don't appear or are not complete. Oh, and yes, you do wear it in the swim too! As noted previously, for the many athletes taking part in Relay events, the timing chip acts as your 'baton', so ensure that it is correctly transferred (from the swimmers ankle, to the cyclists ankle, to the runners ankle...) after each discipline. It really does make things a lot simpler come results time. The biggest triathlon Expo of the year takes place alongside the race and, as it's getting well into the latter half of the season, there will be lots of bargains there for those in need of retail therapy. It's also a safety net for those who manage to lose, forget or break vital bits of kit - we've even heard of people buying their wetsuits and bikes for the race at the Expo. Travel to ExCeL needs careful planning as a lot of the access roads are closed off for the bike course. The best route in is on the A13, HOWEVER (and a reminder to check that RACE PACK! ), do take note of which car park to use. 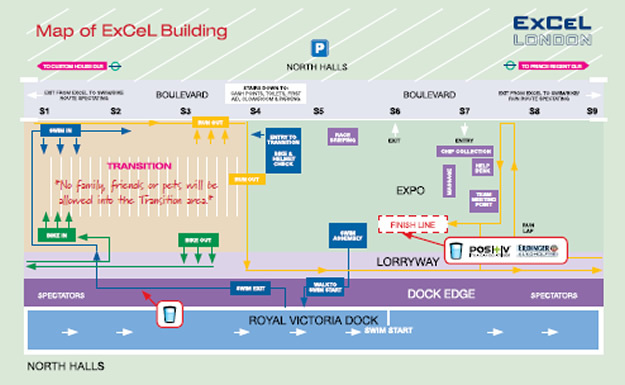 The west entrance to ExCeL (Undercroft car park) has a 1.9metre height restriction, so if you are transporting a bike on the roof of the car, you are strongly encouraged to use the east (North Halls) car park! For spectators, however, the DLR is the most direct connection to the venue with links into central London and both the Underground and regular rail services. ExCeL London is connected to the Jubilee line at Canning Town via a three minute DLR journey. There is plenty of catering on-site with a wide choice of outlets in the central spine of the building plus a couple of restaurants and bars in the immediate area. There are a lot of new hotels but expect most to be fully booked for the event. The floating hotel moored in the dock next to ExCeL is a great, if expensive, location. I live in South London, am racing this Sunday afternoon & have to rack my bike on the Saturday. I've looked at the rail links as I don't really want to drive and it's proper tricky getting there with a cycle. And then you've got to get home again. Having looked online & also rung the council, I'm going to get the overground from London Bridge to Woolwich Dockyard (platform 1 takes 19mins). There's a foot tunnel which brings you out by King George V dock, which is right next to Victoria dock where the swim is. The council said the tunnel will be open and plan B is to use the Woolwich ferry - free & every 15mins. Plan C is to use the Greenwich foot tunnel a mile or so to the west.. Please do your own research, but it's the best route I've managed to work out with a bike in tow. It saves me wondering if I can get a bike in a black cab with the front wheel off - bearing in mind loads of the roads will be shut! Just completed my 7th London Tri - and struggled home to Barnet - took from 5 until 8:30 joining up trains and biking in between because too tired to ride all the way, mainly uphill and in partial dark without lights. Every year when my husband and I struggle in with our bikes on Sat and then out with not only bikes but all our gear on our backs, I curse transport for london, especially DLR. On marathon day, transport is free for runners and runners are heavily supported by local people and supporters whom non-locals bring with them. The same is happening as tri grows - when then, can TFL not make some concessions to allow us easier travel? Why are the connections from North London, for example, to East London so devilishly hard? And why is DLR so pigheaded? Most important of all, given the massive price we pay for entering tri, why do the organizers of London Triathlon and of TRI uk not do something about the situation? I live in Limehouse and I've just noticed today that DLR are doing a bike trial. Non-folding bikes can currently be carried on the DLR at weekends and off peak during the week.